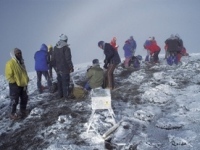 The Marangu route is often considered the easiest and one of the most popular routes to the summit, the Marangu route is used by almost 40% of all climbers and uses comfortable mountain huts with solar power lighting. 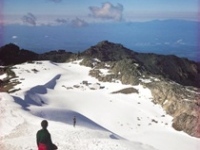 It is suitable for those adventurers who are not particularly experienced in the mountains, therefore classified as a moderate trek rather than a climb. The views are beautiful and each day of walking progresses through a different climate zone, adding considerably to the interest of the trek. 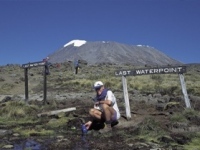 The real highlight is the walk from Gillman's point along the crater rim to Uhuru Peak, passing close to the spectacular glaciers and ice cliffs that occupy most of the summit area. 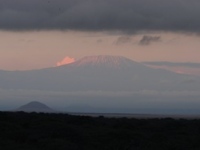 The views as the sun rises behind Mawenzi on a clear morning are absolutely magnificent - The Rift Valley, Mt. Meru and the Masai Steppes stand out from the endless plains, almost three vertical miles below. Meet and Greet transfers from airport to hotel and return to airport, including transfers to and from the National Park Gate. Two hotel nights at Springlands Hotel located in Moshi, one night prior to the Mt. Kilimanjaro Hike and one night upon return. All park fees, hut fees, rescue fees during the Mt. 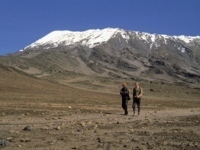 Kilimanjaro trek. Enquire about other Mt. 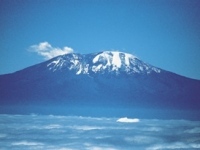 Kilimanjaro treks that are available. Morning arrival into Addis Ababa with a convenient connection for your flight to Mt. Kilimanjaro airport. Meet and Greet services at the airport and transfer to Springlands Hotel located in Moshi Town close to the foothills of Mount Kilimanjaro. Late this afternoon there will be a climb briefing with the balance of the evening at leisure. After a morning of leisure, transfer early this afternoon to board your Ethiopian Airline flight from Mt. Kilimanjaro Airport to Addis Ababa with a convenient connection for the overnight flight to Washington DC. Inquire about optional Wildlife Safari extensions or a visit to the island of Zanzibar.